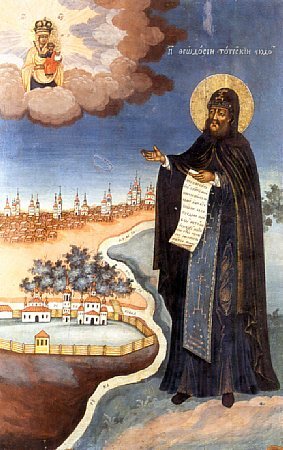 The Monk Theodosii (Feodosii) Sumorin of Totemsk was born at Vologda in about the year 1530. In his youth he was raised in a spirit of Christian piety and the fear of God. At the insistence of his parents he married, but family life did not sway him away from God. He went fervently to church and prayed much at home, particularly at night. After the death of both his parents and his spouse, he withdrew to the Prilutsk monastery not far from Vologda. At the monastery Theodosii passed through the various obediences: he carried water, chopped fire-wood, milled flour and baked bread. Having set out on business entrusted him by the hegumen to go to Tot'ma to search out a salt-works for the monastery, he sought the permission of tsar Ivan Vasilevich and the blessing of archbishop Nikandr to found at Tot'ma a monastery. Theodosii was appointed head of this newly-formed Totemsk monastery, which in the grammota-grant of 1554 was declared free of taxation. The monk therefore founded the Totemsk Ephremov wilderness monastery and brought brethren into it. And eventually the head of two monasteries, Theodosii continued to lead an ascetic life: he wore down his body with chains and hairshirt, and beneathe the schemamonk cowl he wore an iron cap. Fond of spiritual reading, he located for the monastery many a book. The monk reposed in the year 1568 and was buried in the monastery founded by him. At his grave miracles occurred. On 2 September 1796 at the time of a reconstruction of the Ascension church his relics were found undecayed, and their glorification was made on 28 January 1798, on the day of his repose.